Google has prepared two new soon-to-be-released sets for those who wish to work with the basics of artificial intelligence. 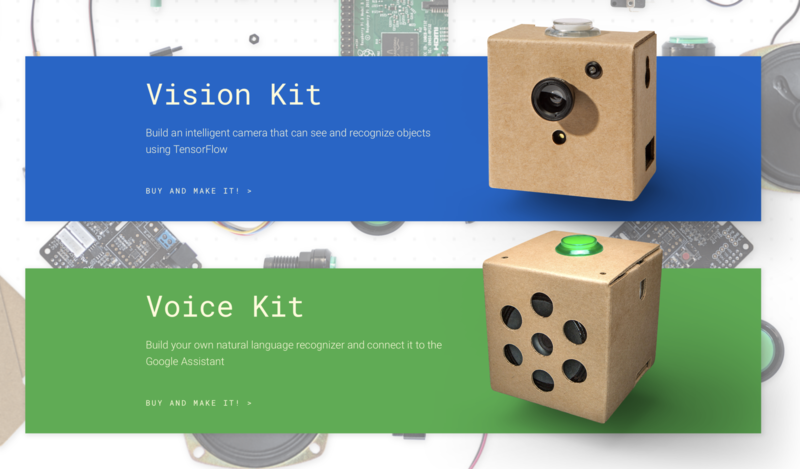 Self-assembly kits AIY Vision Kit and AIY Voice Kit include all hardware and software components necessary for creating your own AI system. In particular, Vision includes a new Raspberry Pi Camera v2 with the ability to recognize people and objects, the motherboard and the necessary accessories. In order for this to work, computer vision uses the neural network TensorFlow. Google positions the AIY Vision Kit as a cheap and simple computer vision system, which, thanks to the availability of an additional processor, does not require access to cloud processing. The kit offers several simple applications, including setting up the camera to detect a user's dog or car. Also more interesting possibilities are available, such as identification of plants and animals. The Voice Kit includes a Google Voice Hardware Attached on Top (HAT) expansion board, a motherboard with a stereo microphone, a button, a loudspeaker, connectors and wires. Enthusiasts can use a prefab device to add a voice interface and virtual assistant to their projects. Both sets come with a compact computer system Raspberry Pi Zero WH, an SD memory card (with preinstalled software), a USB cable and folding cardboard cases. In addition to updating DIY-kits, the company introduced the Google AIY Projects application, designed to facilitate the configuration of devices "through the air." For now, only the version for Android is available, but the developers promise to add support for iOS and Chrome OS soon. The company also developed AIY-models - a set of pre-trained neural networks that work with any AIY-sets. The price of the AIY Voice kit is $ 50, and for AIY Vision you will have to pay $ 90.